The options discussed below are in the very early stages of development and there are no plans at this time to implement anything shown here. Because of widespread interest, this page is provided to explain these proposals and the current planning status. Everything on this page is subject to change. Bandera Road (SH 16) between Loops 410 and 1604 in Leon Valley and Northwest San Antonio is the eighth most congested road in the region and 62nd most congested in the state. About 60,000 vehicles a day use the southern half of the route and about 40,000 using the northern half. To put that into perspective, the section of Loop 410 on the South Side between I-35 and I-37 carries about 50,000 vehicles per day and the stretch of Loop 1604 between SH 151 and US 90 currently being upgraded to a freeway carries less than 40,000 vehicles per day (although that's likely to increase after the construction is complete.) So improvements to Bandera Road are urgently needed and have been for decades, but the road has languished with only a few minor improvements since the mid '80s. The problem has not been that officials haven't recognized this need; there have been various proposals to upgrade Bandera Rd. over the past three decades. The snag has been finding improvements that are amenable to the City of Leon Valley. A flyover proposal by TxDOT back around 1990 was shot down by Leon Valley leaders and an alternative plan that proposed building an elevated highway along Leon Creek and bypassing Leon Valley altogether also was nixed for various reasons. This schism resulted in the tabling of any new efforts to make major improvements to Bandera Rd. for a couple of decades. Then, in 2009, the Alamo Area Regional Mobility Authority (ARMA) included Bandera Rd. in their regional toll system plan. The conceptual proposal was an elevated tollway along the length of Bandera between the loops. However, subsequent feasibility studies-- and simmering opposition from several constituencies-- scuttled that plan. TxDOT then took over studying other options to relieve congestion in the corridor. That brings us to today. While this section is named the "flyover proposal", TxDOT has actually been studying a number of options to relieve congestion on Bandera Rd. ; the flyover option has simply become the most well-known and controversial of them. Through traffic: Current estimates are that about 7-8% of traffic on Bandera travels from Loop 410 to Loop 1604. However, with continuing growth outside Loop 1604, it is expected that percentage will increase. Superstreet: This would convert all intersections in the corridor to a superstreet configuration. Additional through lanes could also be included in this plan. Thoroughfare network improvements: Working with the City of San Antonio, TxDOT has identified possible extensions to Guilbeau and to Eckhert that would remove much of the "zig-zag" traffic from the section of Bandera between those intersections. The City has agreed to study these further and has even put the Guilbeau extension on its list for future funding. Reversible connector: This concept would build an elevated, reversible roadway to provide a direct express lane for the "zig-zag" traffic movement for traffic going between Eckhert and Mainland/Guilbeau. Traditional freeway: This would build a standard freeway corridor with mainlanes, overpasses, ramps, and access roads. This proposal, however, would require substantial additional right-of-way, which makes it extremely expensive and disruptive; as a result, this plan is almost certainly DOA. Elevated throughway: This proposal, commonly-referred to as the "flyover" plan, would consist of shifting the existing lanes slightly further outward and building an elevated roadway on piers located in the center median. 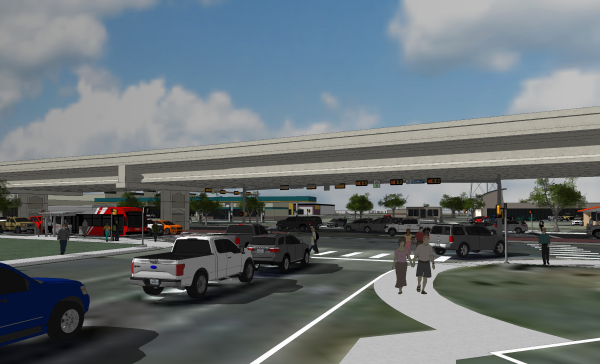 This elevated roadway, running from Loop 410 to Loop 1604, would overhang the surface lanes and consist of a single lane and a shoulder in each direction to carry through traffic, similar to the flyovers connecting Bandera and Loop 410. Due to right-of-way constraints that limit possible "touch-down" locations for entrance and exit ramps, access points along the elevated section would be very limited. 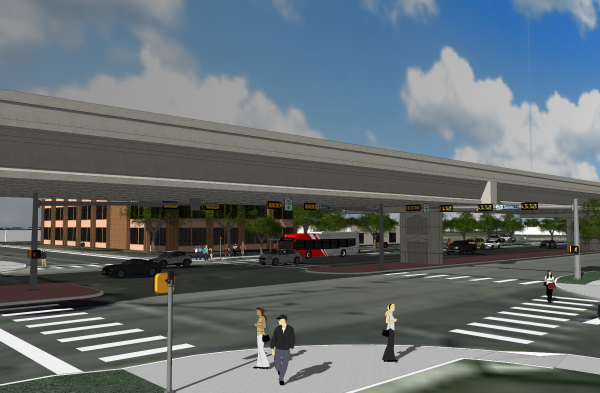 The elevated lanes would tie-into the existing flyovers connecting to Loop 410. There are currently no plans for this road to be tolled. While the initial studies and modeling showed that, of the options listed above, the elevated throughway provided the most benefit at reasonable cost, it was determined that none of the above proposals individually provided more than limited, short-term congestion relief. In addition to existing traffic volumes, there is an unknown‑‑ but almost certainly quite large‑‑ amount of "latent demand", that is, drivers who are using alternate routes to avoid the congestion on Bandera. Improvements to Bandera would result in the return of many of those commuters, overwhelming the improvements. Therefore, a combination of some of the above‑‑ or possibly something else not studied to date‑‑ is likely going to be needed. 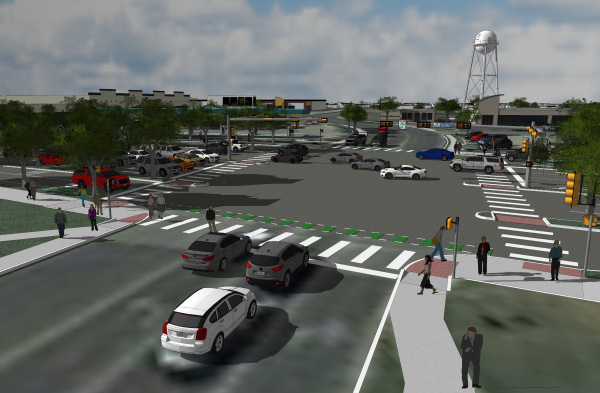 As with previous flyover proposals, the current flyover option has generated controversy in Leon Valley. Chief among the concerns of many leaders and citizens there is that a flyover would speed traffic through the suburb. This, it is asserted, would mean drivers would speed past the businesses along Bandera, thus negatively affecting them. These businesses, of course, comprise an outsized portion of that city's tax base, so their concern is understandable. (Of course, congestion also negatively impacts those businesses, perhaps even more than a flyover would.) Additionally, there is great concern about the aesthetics of an elevated road. These concerns specifically are that it would be unsightly and create a visual barrier that would divide the city and negatively impact property values. There is also angst about the noise that an elevated road would generate. Because of these concerns, the City of Leon Valley asked TxDOT to suspend its planning while it sought and evaluated other options. At present, TxDOT is in a holding pattern while Leon Valley completes their study. In a search for other possible solutions, Leon Valley enlisted the assistance of UTSA's Center for Urban and Regional Planning Research and the Institute for Economic Development. 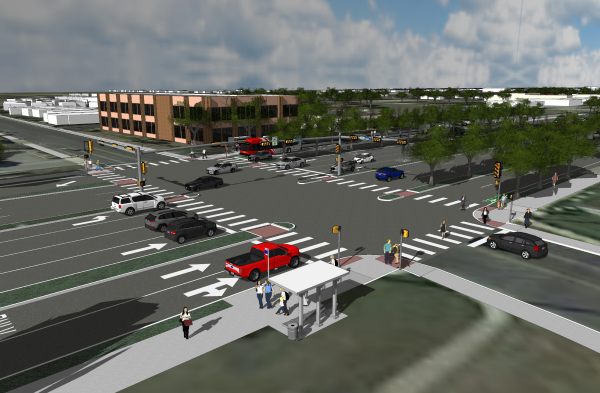 After researching other concepts, they developed a proposal for what is known as a "multi-way boulevard." As envisioned, this would be a 10 lane at-grade thoroughfare with signalized intersections in the same locations as today. The 10 lanes would include three main through lanes in each direction with two parallel frontage lanes on each side. The frontage lanes would be built in the area used today for the drainage culverts on the side of the road and would be physically separated from the through lanes by landscaped traffic islands. Just like the frontage roads along a freeway, the frontage lanes in this concept would provide access to adjacent properties and would be the location for sidewalks, bus stops, and bike lanes. Depending on how it is designed, traffic would move between the through lanes and frontage lanes either at the intersections or, more likely, via slip ramps between intersections. There are several examples of multi-way boulevards in the US including Queens Blvd. and Ocean Pkwy. in New York City, Octavia Blvd. in San Francisco, and Bothell Way in Bothell, Washington. There is even a smaller-scale example here in San Antonio: Verano Pkwy. on the Texas A&M-San Antonio campus on the South Side. All of these examples include on-street parking, however, which the Bandera proposal almost certainly would not. By isolating slower local traffic to the frontage lanes, traffic in the through lanes can move faster and more safely. With 10 lanes, the corridor would have about 66% more lane capacity than today. The boulevard would be landscaped with trees and other foliage, making the corridor more pleasant and inviting especially for pedestrians and cyclists. Because there are no elevated structures, a boulevard would be much less obtrusive than an elevated highway, thus minimizing visual and sound impacts. While the flyover proposal would require little if any additional right-of-way, the boulevard proposal would almost certainly require some additional right-of-way, although the exact amount has not yet been determined. 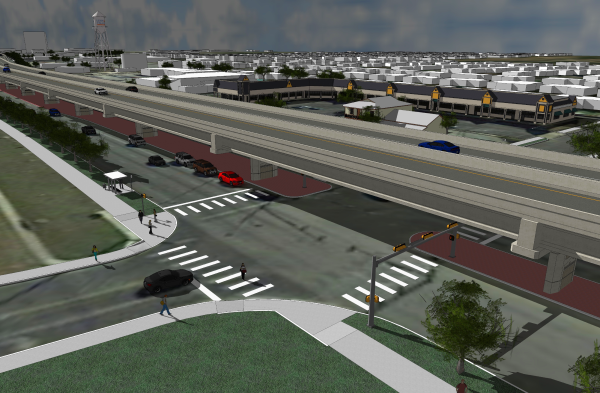 In addition to traffic, access, and aesthetic considerations, UTSA's Institute of Economic Development was asked to study the effect an elevated road might have on property values. Unfortunately, there's a dearth of direct data on the subject. However, data was available on the impact when elevated freeways were torn-down. This data showed that doing so resulted in a substantial increase in adjacent property values. Based on that, UTSA's researchers extrapolated that building an elevated expressway through Leon Valley would result in an equally inverse decrease in property values. There is also evidence that increasing the walkability of an area increases adjacent property values. It is important to note that, to date, the boulevard concept is just that-- a concept. It has not been fully engineered and vetted to ascertain traffic capacity, safety issues, cost, and other more technical considerations. Until that is done, there's no way to fairly compare this proposal to any of TxDOT's proposals. 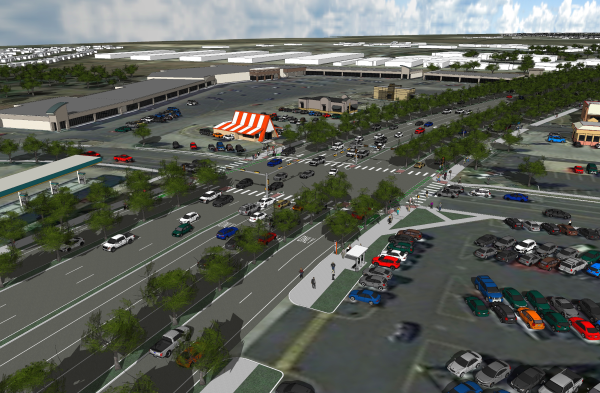 UTSA's researchers have admitted that the boulevard proposal, while adding capacity, is not likely to solve congestion issues. Instead, it makes improvements while further considering additional transportation modes, adjacent land uses, and economic impacts. 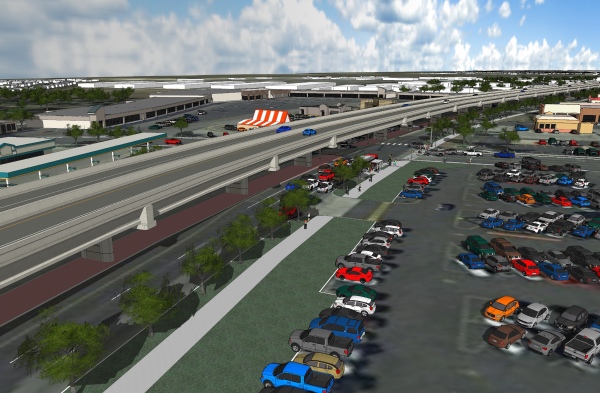 In conjunction with the boulevard plan, UTSA's team also emphasizes the need for expansion of other nearby roadways as well as the overall road network itself. 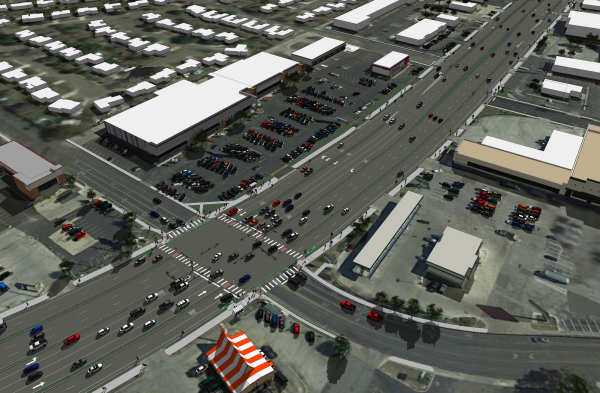 Animation illustrating both the "flyover" and boulevard proposals. This is at Bandera and Huebner looking north. Once Leon Valley completes its study and notifies TxDOT of such, TxDOT will resume their study. They have indicated they are open to all proposals and concepts and will include the boulevard concept in their analysis and comparisons. There is a major philosophical difference at play that will need to see resolution before a project can come to fruition. TxDOT's stated need for the corridor is congestion relief and so their evaluation and scoring of solutions will naturally focus on that as the primary criteria along with safety and cost. 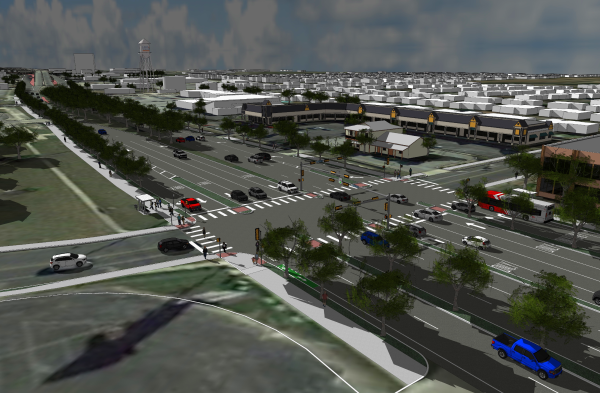 Leon Valley, on the other hand, is desirous of a more holistic solution that incorporates adjacent land uses and the broader economic well-being of their city into the future design of Bandera Road. TxDOT has stated that they are willing to work with all stakeholders to incorporate other concerns as much as possible. Once a decision on which options(s) to pursue has been made, TxDOT would seek Leon Valley's endorsement, both as a courtesy to that community but also because Leon Valley will have to assist acquiring right-of-way for whatever is built. If that approval is given, it would likely be at least 2028 at the earliest before any construction could begin. That date is contingent on many factors such as the time needed for engineering, funding, right-of-way acquisition, and utility relocation. If approval from Leon Valley is not forthcoming, TxDOT could either go it alone or simply make improvements to the San Antonio section of Bandera north of Eckhert. It is even conceivable that two different options might be implemented‑‑ one in Leon Valley and another in San Antonio; however, that seems rather unlikely. Stay tuned --this promises to be at least as interesting at the US 281 brouhaha was! 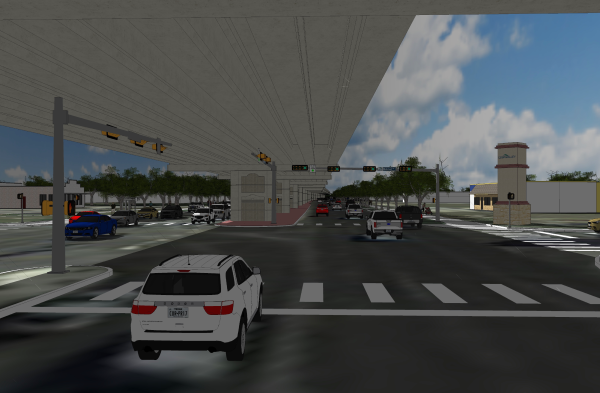 Below are selected renderings created by UTSA of both the flyover and boulevard proposals. These renderings are only for illustrative purposes and don't represent any actual plans. A sincere thank you goes to the UTSA Center for Urban and Regional Planning Research and the City of Leon Valley for making these available. Below are some frequently-asked questions and comments about this corridor. Why can't they just synchronize the traffic signals on Bandera? This would help a lot. Actually, the signals on Bandera are already part of a coordinated system and are optimized. Many people think that synchronizing (coordinating) signals is a magic solution to all congestion. While in many situations it can and does provide substantial benefits, the fact is that coordinated signals can only provide improvements up to the point where traffic volumes on a road reach the saturation point. Bandera well exceeds that level. The way that signal coordination provides relief is by breaking traffic into groups (platoons) and moving them through at a set speed with the gaps between platoons used for cross-traffic and left turn movements. When traffic on a roadway exceeds capacity, stopping traffic to create the gaps results in queues that are longer than the subsequent green time can clear. This causes a self-propagating and cumulative backup. The gaps between platoons also fill-up with high volumes of traffic turning from cross streets and driveways. These "interlopers" then use a large portion of the green time that a platoon moving through the corridor would use. The only way to compensate for this is to increase green times on the main road, which then inordinately increases backups on the cross streets. The Bandera corridor is especially vulnerable to this issue because of the high volumes of traffic that turn onto Bandera from Guilbeau, Mainland, Eckhert, Huebner, and Grissom. In short, in a situation like that on Bandera, the capacity of even the best-timed signals is easily and regularly exceeded. Why did they build the flyovers at Loop 410? They don't really help and were a waste of money. As is often the case, this perspective ignores the bigger picture. The flyovers at Loop 410 take the heaviest traffic movement at that location and remove it from two already-congested signalized intersections. While traffic coming from Loop 410 to Bandera regularly backs-up during the afternoon rush hour, it does so out of the way of the surface intersections. More importantly, before the flyovers were built, that traffic nearly always backed-up onto the Loop 410 mainlanes, which was a dangerous situation. Now, that traffic is stored safely out of the way. Meanwhile, traffic headed the other way enjoys a good five minutes or more of time savings during the morning rush hour. If and when Bandera through Leon Valley is improved, commuters going from Loop 410 to Bandera during the afternoon rush hour will enjoy the full potential benefits of the existing flyover. While congestion at that location may make it seem like the flyovers don't help, the point that's often forgotten is this: how much worse would the congestion there be without the flyovers? The existing flyovers have caused several nearby businesses to go under. I am only aware of one business that has claimed it was harmed by the flyovers. Regardless, there is no objective data (to my knowledge) to support that claim. It could have been a case of that business already having difficulties that were exacerbated by the traffic changes, or, perhaps, the flyovers are being used as a scapegoat. The other established businesses in the area seem to be doing fine. Regardless, congestion is at least equally detrimental to businesses if not more so, so improvements need to be made. While nobody wants to see businesses fail, there will, unfortunately, always be trade-offs whenever a major change is made and attempts are made to minimize those impacts. Traffic has been bad on Bandera for decades-- why hasn't anything been done? Texas Public Radio: Gridlock Gripes: What's The Best Fix For Traffic on Bandera Road?